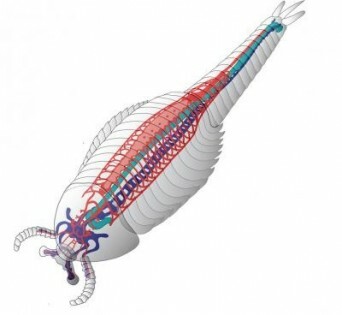 In 520 million-year-old fossil deposits resembling an ‘invertebrate version of Pompeii,’ researchers have found an ancestor of modern crustaceans revealing the first-known cardiovascular system in exquisitely preserved detail. An international team of researchers from the University of Arizona, China and the United Kingdom has discovered the earliest known cardiovascular system, and the first to clearly show a sophisticated system complete with heart and blood vessels, in fossilized remains of an extinct marine creature that lived over half a billion years ago. The finding sheds new light on the evolution of body organization in the animal kingdom and shows that even the earliest creatures had internal organizational systems that strongly resemble those found in their modern descendants. “This is the first preserved vascular system that we know of,” said Nicholas Strausfeld, a Regents’ Professor of Neuroscience at the University of Arizona’s Department of Neuroscience, who helped analyze the find. Being one of the world’s foremost experts in arthropod morphology and neuroanatomy, Strausfeld is no stranger to finding meaningful and unexpected answers to long-standing mysteries in the remains of creatures that went extinct so long ago scientists still argue over where to place them in the evolutionary tree. The 3-inch-long fossil was entombed in fine dustlike particles – now preserved as fine-grain mudstone – during the Cambrian Period 520 million years ago in what today is the Yunnan province in China. Found by co-author Peiyun Cong near Kunming, it belongs to the species Fuxianhuia protensa, an extinct lineage of arthropods combining advanced internal anatomy with a primitive body plan. In fact, Strausfeld pointed out, Fuxianhuia‘s vascular system is more complex than what is found in many modern crustaceans. “Over the course of evolution, certain segments of the animals’ body became specialized for certain things, while others became less important and, correspondingly, certain parts of the vascular system became less elaborate,” Strausfeld said. Strausfeld helped identify the oldest known fossilized brain in a different specimen of the same fossil species, as well as the first evidence of a completely preserved nervous system similar to that of a modern chelicerates, such as a horseshoe crab or a scorpion. “This is another remarkable example of the preservation of an organ system that nobody would have thought could become fossilized,” he said. In addition to the exquisitely preserved heart and blood vessels, outlined as traces of carbon embedded in the surrounding mineralized remains of the fossil, it also features the eyes, antennae and external morphology of the animal. Using a clever imaging technique that selectively reveals different structures in the fossil based on their chemical composition, collaborator Xiaoya Ma at London’s Natural History Museum was able to identify the heart, which extended along the main part of the body, and its many lateral arteries corresponding to each segment. Its arteries were composed of carbon-rich deposits and gave rise to long channels, which presumably took blood to limbs and other organs. Researchers can only speculate as to why the chemical reactions that occurred during the process of fossilization allowed for this unusual and rare kind of preservation, and as to why only select tissues were preserved between a few rare and different specimen. Possibly, only one in thousands of fossils might have such a well-preserved organ system, Strausfeld said. At the time Fuxianhuia crawled on the seafloor or swam through water, life had not yet conquered land. Tsunamis may also be the cause for the exceptional preservation.